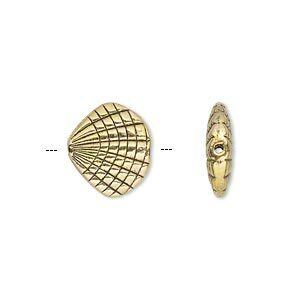 Bead, antique gold-finished "pewter" (zinc-based alloy), 14x13mm double-sided shell. Sold per pkg of 8. With eye-catching detail, these beads are made of "pewter" (zinc-based alloy) and feature an attractive antique gold finish. 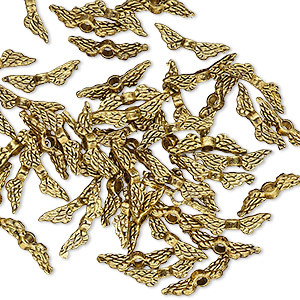 Bead, antique gold-finished "pewter" (zinc-based alloy), 19x7mm double-sided wing. Sold per pkg 10. 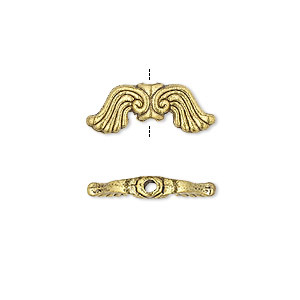 Bead, antique gold-finished "pewter" (zinc-based alloy), 11x3mm double-sided wing. Sold per pkg of 50. 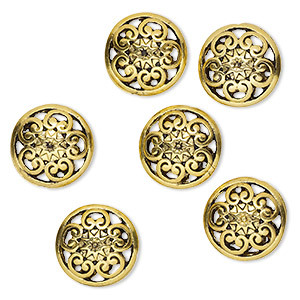 Bead, antique gold-finished "pewter" (zinc-based alloy), 16mm double-sided filigree puffed flat round. Sold per pkg of 6. 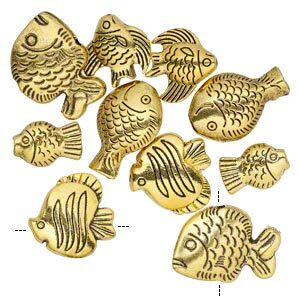 Bead, antique gold-finished "pewter" (zinc-based alloy), 14x10mm-23x16mm assorted double-sided fish. Sold per pkg of 10. 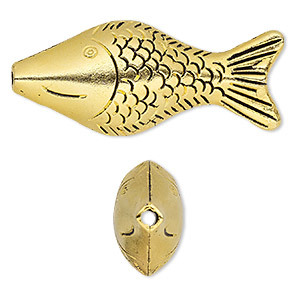 Bead, antiqued gold-finished "pewter" (zinc-based alloy), 52x22mm double-sided fish with 2.5mm hole. Sold per pkg of 2. 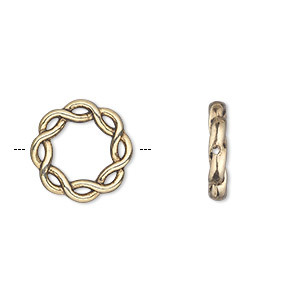 Bead frame, antique gold-finished "pewter" (zinc-based alloy), 15mm double-sided braided circle with 8mm center hole. Sold per pkg of 20. 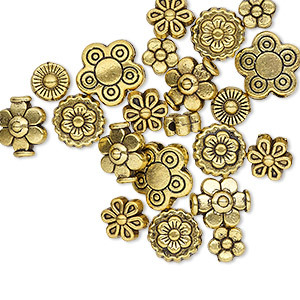 Bead, antique gold-finished "pewter" (zinc-based alloy), 5x5mm-10x10mm assorted flower. Sold per pkg of 24. 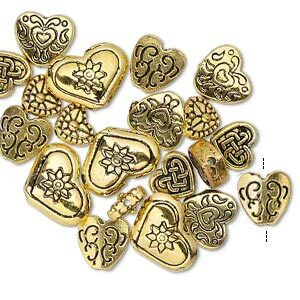 Bead, antique gold-finished "pewter" (zinc-based alloy), 8x7mm-16x12mm assorted double-sided heart. Sold per pkg of 20. 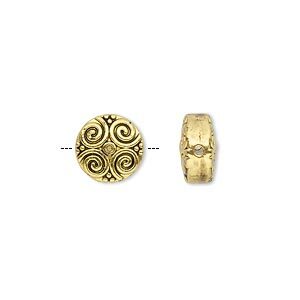 Bead, antique gold-finished "pewter" (zinc-based alloy), 10mm double-sided flat round with spiral design. Sold per pkg of 10. 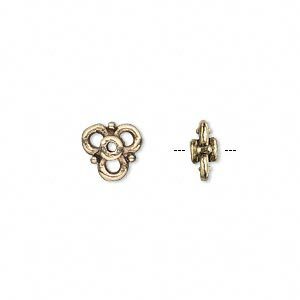 Bead, antiqued gold-finished "pewter" (zinc-based alloy), 9x4mm double-sided flower rondelle. Sold per pkg of 20.